Tenkara flies for bass? Sure! In Japan, tenkara is used exclusively in mountain streams and exclusively for trout. In the US, more and more tenkara anglers are pushing the envelope and using tenkara rods in other waters and for other species. Bass and bluegills immediately come to mind. There are wide swaths of this country that do not have mountain streams and do not have trout. Most of the troutless swaths have bass and sunfish, though, both of which are just too much fun to ignore. I have used a number of different flies when fishing for bass, some more effective than others. 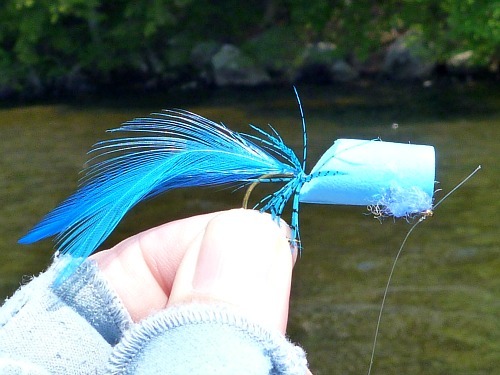 On my 2013 trip to Maine for smallmouth bass, I experimented with several tekara flies for bass - some to expand the range of blue flies with which I'd caught fish (which to be honest was more for fun than for serious fishing) and some to find a good, all-around bass fly that is suitable for use with a wide range of tenkara rods. 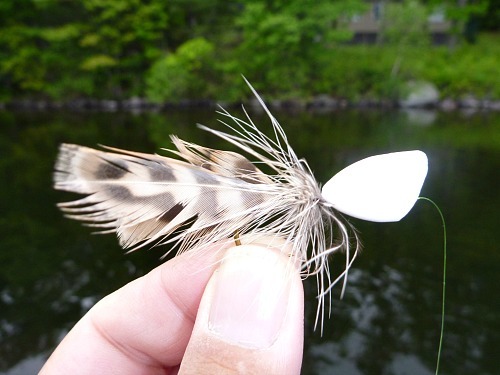 The last time I'd fly fished for bass in Maine, quite a few years earlier, I had a lot of fun with deer hair bass bugs. I do not like tying deer hair bugs, though, so last year I tried some foam bugs with blue feathers and blue yarn - just to see if they would work. 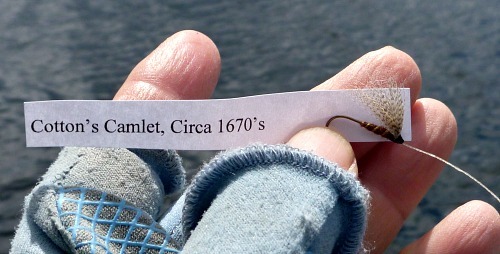 They did and I caught a number of nice bass. The poppers are quite wind resistant and not that easy to cast, though. Longer, stiffer rods and heavier line worked (Daiwa Kiyose 43MF, Nissin 2-Way 450ZX and Daiwa Enshou LT44SF rods and level flourocarbon size 4.5 or a .024" floating fly line). 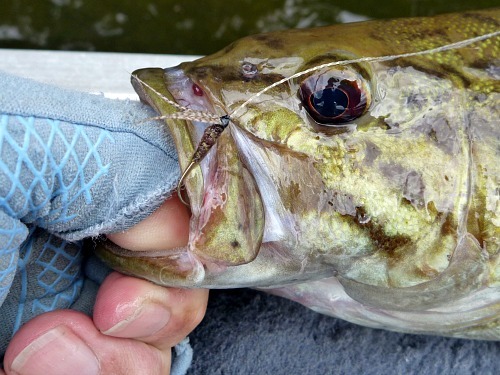 Seeing the bass exploding on a topwater fly does kind of make the heavier rod and line worthwhile, though. The blue worked, but if you are not participating in the Blue Fly Challenge, I think I would go for green or yellow instead. This year, I just used white poppers. I figured that a lot of frogs have white bellies and a fish coming from underneath can't see the top of the popper anyway. Having a bright white popper did make it very easy for me to see, though. What I found very surprising this year was that a number of fish didn't smash the popper, they just sucked it in - sometimes making no splash and barely even a ripple. The popper just disappeared! Because the hook extended so far behind the popper body, and the popper definitely floated with the hook angling down (along with the feather "legs"), perhaps the bass just came up quietly, sucked in the legs (and hook!) and went back down. I didn't miss many of those fish - unlike the ones who explode under it. 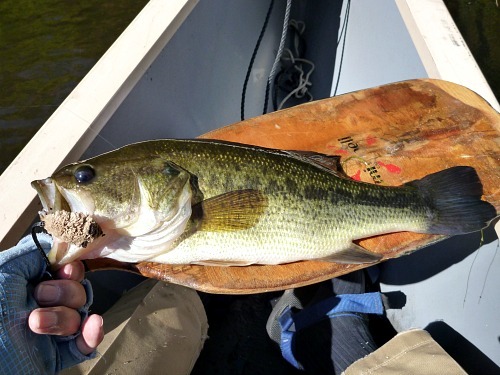 Of course, if you DID want to see a bass explode on a fly, you might want to fish a big deer hair mouse. You'll need a pretty beefy rod to fish it (I used a Daiwa Kiyose 42SF) but it is an exciting sight. 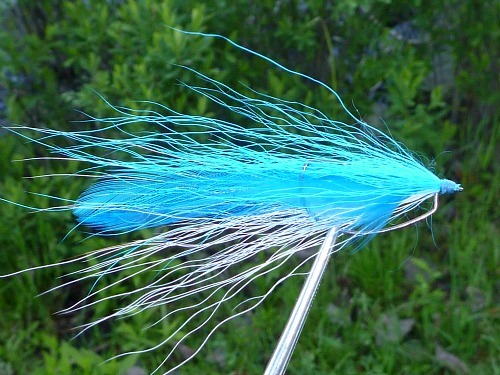 This is a fly that I think has a lot of potential (although probably more potential in a more traditional olive or chartreuse over white rather than blue over white). The fly is an adaptation of Lefty's Deceiver tied on an offset wide gap worm hook. Tying flies so they swim hook up to reduce snags is nothing new. The Clouser Minnow is perhaps the best known, although it uses lead or beadchain eyes to make the fly swim hook up. Lead or brass eyes are really too heavy for tenkara. This fly just uses the shape of the hook to force a hook up orientation. Years ago, Mustad made keel hooks that served the same purpose, but they are long out of production. Offset worm hooks work well and are readily available in a wide range of sizes. Since the fly is not weighted at all, it swims just under the surface. You can easily see the fly and guide it by moving your rod tip to one side or the other to swim it around weeds and branches. Offset "wide gap" worm hooks have the hook point in direct line with the the hook eye. With the saddle hackles and bucktail on either side of the hook point, the fly is surprisingly weedless. I threw it in the midst of some pretty thick stuff and it almost never got hung up. I was really surprised at the stuff I could fish it through. I caught bass and pickerel with the fly. For this fly in particular, follow Carlos Blatt's advice to fish a light line rather than a floating line when fishing ponds with lily pads and grass. The light line in the air will not get caught up in the vegetation like a floating line would. 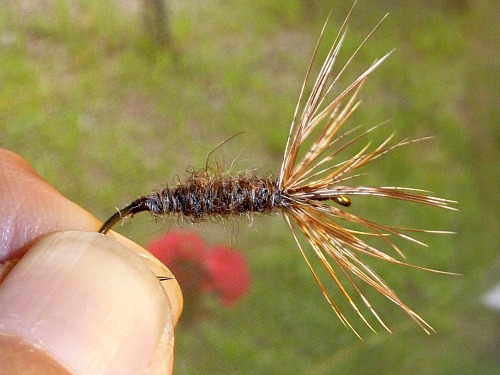 Of all the tenkara flies for bass I have used, the best, by far, was a big kebari tied with a wool yarn body and large partridge or pheasant hackle. I now call it the Keeper Kebari. The fly shown is tied with Nymph Yarn and partridge, although I had equal success with the Black Killer Bug yarn and hen pheasant breast hackle. 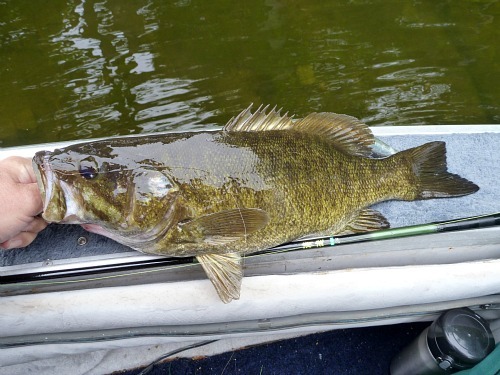 The fly is big enough that the smallies would come up off the bottom to get it, including the largest fish I've caught to date with either a tenkara or keiryu rod, the 20 1/2" smallmouth shown below. Still, the fly is small enough that even sunfish or very small bass could take it. By the way, it works quite well for trout also. Perhaps the best thing about the fly, aside from it being very effective, is that you can cast it with any tenkara rod. After this years trip, though, when I mostly fished beefy keiryu rods, I'd say the best thing about the fly is that the light colored pheasant or partridge hackle is really pretty visible when the fly is underwater, so you can sight fish. I could see a fish come up, open its mouth, close its mouth and turn back down. Fish on! A black Killer Bugger was just as effective, but the Keeper Kebari was more fun to fish because I could see the takes. Perhaps just as much fun, at least if you have any interest in fly fishing history, is to fish a historic fly. Paul W. Jones, who runs the Historic Angling Enterprises website, sent me a few flies he tied to some of the earliest fly patterns known. The one shown above, Charles Cotton's Camlet (originally tied with a camel hair and silk) is just as effective now as it was almost 350 years ago. Snelled to horsehair, and fished with a horsehair line, the only way to be more authentic would be to fish with a wooden loop rod.